Today marks a big milestone in the life of William “Shorty” Sander, our longtime service professional and Field Supervisor. Longtime does not do it justice as today is Shorty’s 50th anniversary with Conditioned Air. Yes, five zero, 50. He came to work on July 24, 1968 when CAC had only 12 people. 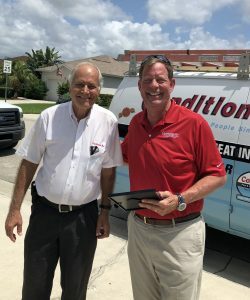 50 years of loyalty to the people of Conditioned Air, our customers and clients all over southwest Florida and the industry and profession he loves. What a landmark day in Shorty’s life and fortunately for all of us, our lives as well. Shorty is part of the foundation and fabric that is Conditioned Air and his contribution to the lives of people here and the people we serve cannot be overstated.